Although he lives next to the course of Liège-Bastogne-Liège and it is consequently seen as his home race, Philippe Gilbert has made clear that in terms of priorities, taking his first Milan Sanremo would be ranked higher for him than a second La Doyenne. The Italian race has long been a big goal for him and with the new climb of the Pompeiana introduced between the ascents of the Cipressa and the Poggio, thus making the finale more difficult, he believes that his chances have been boosted. Because of that ambitious plus his desire to ride strongly in the Ardennes Classics – three races he won in his standout 2011 season – he confirms that he will pass up one of the top Belgian Classics. It’s a race he wants to win, but he will put that ambition off until the future. Indeed Gilbert said on more than one occasion in the past that he hopes to win all of the top Classics before the end of his career. Flanders and Roubaix are two which are missing from his palmares, as well as Sanremo, but his big priority is to get back to winning regularly after two relatively quiet seasons. He has said that he has had his best winter training since 2010-2011, and suggests that he could be back to his top form this year. 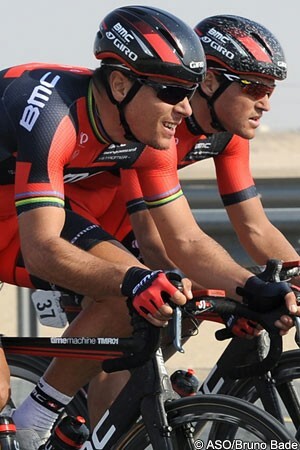 The BMC Racing Team rider made his season debut yesterday in the Tour of Qatar. He rode aggressively, making it into a dangerous move during the stage, then finished in the main bunch. The action continues today and he will once again aim to show his form.